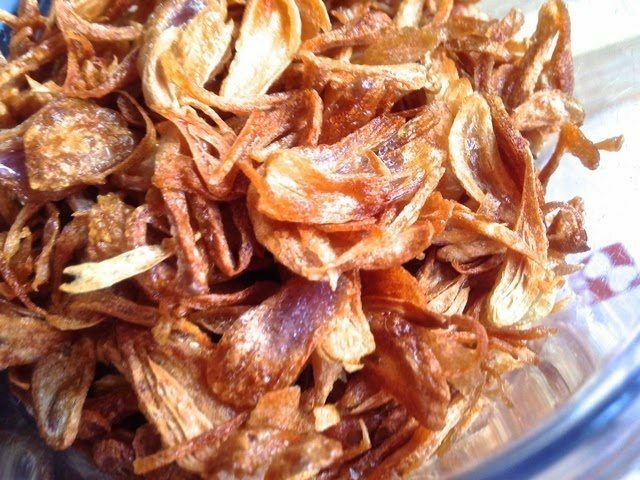 Check out How to Make Crispy Fried Onions by Huang Kitchen on Snapguide. Freshly made crispy fried onions are often used as garnishes in restaurants and at home. It adds flavour to our soups, salads and other Asian dishes when sprinkled on them. Hence to ensure freshness and quality, it’s best that we make them at home. Otherwise you can also buy them in most supermarkets. In a large container, fill with water. Then add some salt to it. Rinse briefly the skinned shallots in the salt water. 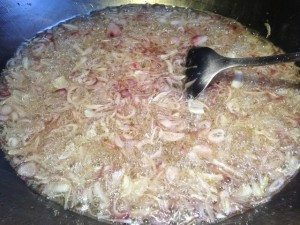 Remove shallots from water, drain and slice the shallots VERY THINLY. (Cut them in half and julienne). Heat oil in frying pan or wok. When oil is hot, put in all the sliced shallots. Stir and fry for about 5 minutes until the onions begin to brown. Reduce the heat to medium-low. Stir and fry for another 2 minutes. Then reduce heat to low. Continue to stir and fry until the slices of shallots turn reddish-brown. 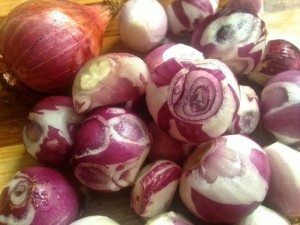 Make sure the sliced onions has significant colour change (so that they remain crispy even after cooled) but careful that they don’t burn (or they will be bitter). Drain the crispy shallots onto a sieve. Then place the shallots on a plate over kitchen paper towel to remove excess oil. When cooled completely, store in airtight container. Add salt into water in a container and add the peeled shallots. Briefly rinse the peeled shallots in the salt water. 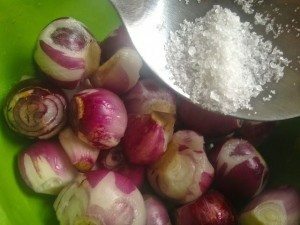 Remove the shallots from the salt water and slice them VERY THINLY. Fry the thinly sliced shallots in hot oil in a wok until reddish brown and crispy. Drain the crispy shallots from the oil into a sieve. 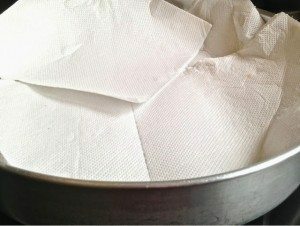 Place the crispy shallots over kitchen paper. Spread the onions as much as possible to remove excess oil and let cool. 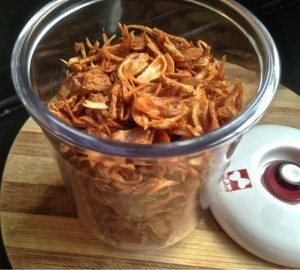 Store in airtight container when fried shallots are cooled completely.